NoteSpace is a collaborative journal or notebook that enables individuals and groups to capture, manage, organize, and share information. Notespace provides a graphical workspace environment where you capture and organize information. With Notespace, you can choose the type of workspace from a set of pre-defined templates, or create entirely new kinds of workspaces to meet your needs. Once you create a workspace, you can drag and drop documents from local and remote file systems, web pages, email, calendars and other desktop tools, audio, video, applets, and third-party components. You can also use NoteSpace tools to draw, type, link, add annotations and build forms. 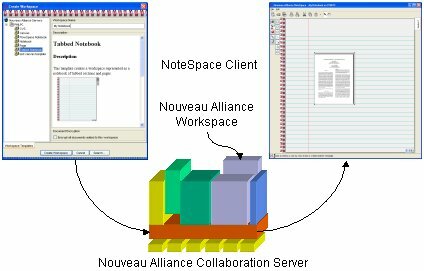 NoteSpace provides a graphical presentation of a Nouveau Alliance Collaboration Server workspace. 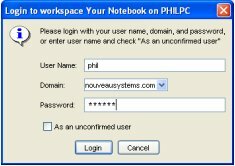 To create a new workspace, you start the NoteSpace thin Java client, select a Nouveau Alliance Collaboration server, and create a workspace by selecting a workspace template. Predefined templates enable you to create a workspace that acts like a tabbed notebook, a notepad, a page, or a drawing canvas. 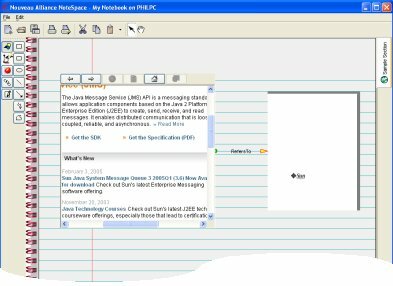 By selecting the "Tabbed Notebook" template, NoteSpace will present the new workspace as a familar notebook with tab sections for organizing your information. You can capture any type of content from external sources into NoteSpace. NoteSpace uses the Nouveau Alliance Content Managent Service to store and manage its content.. For example, to capture a local PDF document, you drag the file from the file manager to a page of the notebook. You can also capture content from other applications. For example, you can capture a web page by dragging the icon in the location bar of a web browser to the notebook page.. 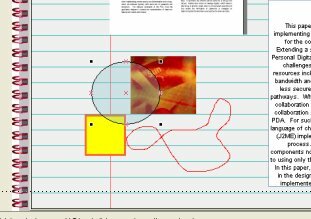 If you want only an image from the web page, you simply drag it to the page in your notebook. 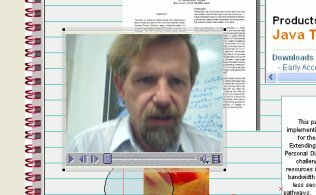 To capture an applet, you drag its web page to the notebook page. 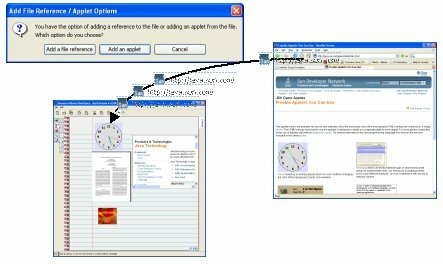 NoteSpace detects applets, and gives you the option of dropping an applet to the notebook page rather than the web page itself. 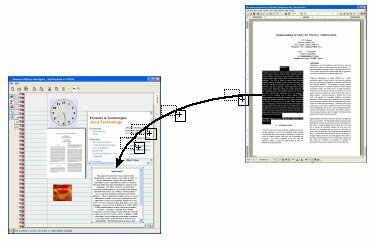 You can capture text or images from mosts productivity applications such as Microsoft Office, OpenOffice or StarOffice. 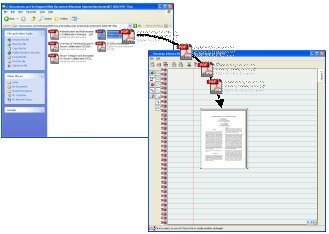 To capture text from a Microsoft Word document, you select the text and copy-drag it to the notebook page. NoteSpace allows you to create new content. You can type, draw, record audio or video, and add controls and components such as form fields, java beans, and third-party viewers from an extensible library. To draw, you select a drawing tool and draw on the page. You can modify drawing properties such as line color and transparency, line style, and fill color and transparency.. If your computer is equipped with a microphone, you can record audio onto a page and, if you have a camera, you can also record video. You can also add controls and components to a page. 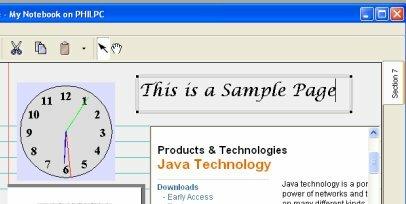 For example, in a bioinformatics application, you could add a Java Bean component that enables you to view and interact with molecules. In an analytic application, you might add a chart of results. There are a variety of controls and components available commercially and as open-source for a wide variety of functions and industries. NoteSpace enables you to use "off the shelf" controls and components without modification. NoteSpace enables you to organize content into collections of .related items. Organizing items into a collection signfies that the items are related, and the type of collection indicates how they are related. Notespace enables you to organize items from both local and remote workspaces into a collection. And because items may have multiple relationships, you can also organize them into multiple collections. The canvas template provides a simple containment collection. You can visually group related items by moving them to the same part of the canvas. The canvas has no fixed height or width, and allows you to pan and scroll to view different groups of items. The note pad and tabbed notebook templates enable you to further organize each group of related items onto a separate page. With the tabbed notebook, you can also organize related pages into tabbed sections. You can specify the placement of tabs, and customize each tab by setting properties such as title, icon, and foreground and background colors. You can also click on the current tab to edit its title directly, and drag an image to the tab to set its icon. Links provide another way to organize related items. 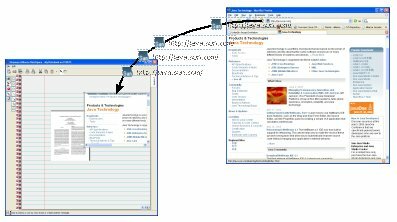 A link specifies a direct relationship between two items, where the link type indicates the kind of relationship. You can define new link types to specify new kinds of relationships. To create a link, draw a line between connection points on the two items. NoteSpace automatically tries to determine the best link type given the objects being linked. You can change the assigned link type at any time. For example, if a web page refers to a whitepaper, a "Refers To" link type is created to record the relationship. 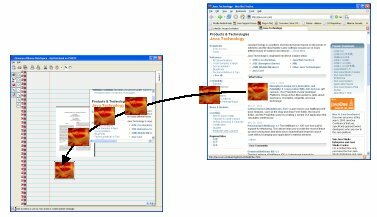 An annotation is a special kind of link that connects the target item being annotated with a source item that is automatically created. The annotation source moves automatically with the annotation target, and is deleted when the target item is deleted. 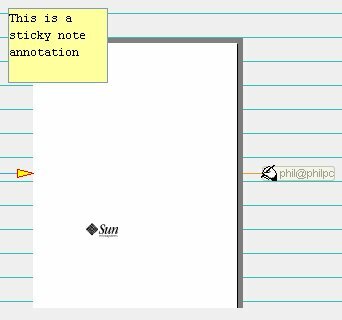 Notespace supports a variety of annotations, and you can create new kinds of annotations at any time. For example, you can add a sticky note to a document, and a digital signature to ensure that changes to the document are detected. NoteSpace supports seemless collaboration among users, including real-time and offline collaboration. Users can share entire workspaces, or just specific containers or items in the workspaces For example, you can "publish" an item from a personal notebook to a shared project notebook by simply dragging the item from your notebook into the project notebook. This adds a reference in the project notebook to the item in your notebook. You can now make changes to the item through either notebook. This important collaboration feature enables you and your team to create "webs" of shared information that are always up to date. Views are another important collaboation feature in NoteSpace. When you open a workspace for the first time, you get your own view of its container and and every item it contains. In a Tabbed Notebook, you get your own view of the notebook, every section, every page, and every item on each page. You can switch sections, turn pages, and even rearrange items on the page without effecting other users. When you decide to collaborate with another user, you simply share the same view. You can share views at any level, from the entire notebook to an individual item on the page. For example, to have a real-time meeting with another user to review an entire notebook, you both open the notebook, then you change to the other user's notebook view. Now, when either of you turns the page or changes sections, both of you see the same thing. If you only want to collaborate on a specific page, you simply change to other user's view of that page. Now both of you see the same thing as you interact with the page, but each of you can change to another page or section without effecting the other one. To collaborate on just the document, you change to the other user's view of the document. Now as you flip through the document, the other user can follow along. NoteSpace provides a number of security features. You can provide secure access to workspaces using configurable standard authentication services, including LDAP, NIS, Microsoft Active Directories. NoteSpace provides a convenient "single sign-on", enabling you to authenticate yourself once, then access any number of other workspaces that use the same authentication services. You can specify that the new workspace, documents, and other content be encrypted. This provides the highest level of physical security for your most senstive information. Notespace also provides individual and group authorization policies for each document in the workspace, giving you complete control over who can access your documents. Together with the Nouveau Alliance Server and Content Management Service, NoteSpace enables you to configure the level of security that is right for your use, from no security to required authentication, access control, encryption, and SSL/TLS secured communication with the Nouveau Alliance Server.